The slideshow to the right shows a portion of my post assessment for the second round of research. The first two pictures provide you with a visual of how I used Google forms and links to my Voki characters to assess student's reading comprehension. It also shows how the results are graphed. The second two pictures are samples of the student self assessment that they took after using multiple technology tools to aid in their reading comprehension. ​​Continue down the page to read about my findings in both round 1 and round 2 of my research. Click on the HOW-TOs link to the far right to learn how to create similar assessments. When analyzing the data collection from the whole class, 46 % of students showed improvement in grade level reading comprehension. 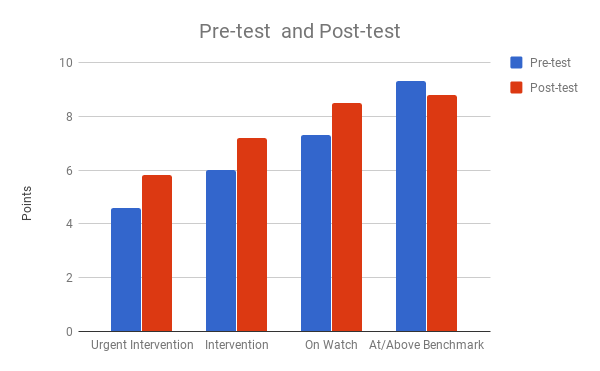 Urgent, intervention, on watch and at/above grade level band averages can be seen below in figure 1. This indicates that the use of technology tools that support grade level text could indeed help some students improve their reading comprehension. It is apparent that the use of technology had a greater impact with students who were not reading at grade level. This knowledge is helpful to teachers and parents so that all children can have a better chance at success when assessing grade level content. Help can be provided at home through the use of adaptive programs like Istation. Figure 1. Most of the subgroups showed improvement after the treatment. This round was a little bit different than the first. This time the post test was given through a google form with links to speaking avitars. Creating and using avitars was not something that the students had a lot of practice with throughout the school year, unlike Tumblebooks in round 1. The results show improvement in comprehension among all subgroups, but it still did not show significant growth. At this time a longer study needs to be conducted to determine if significant growth can be made using technology to aid in reading comprehension. Figure 2: All groups showed improvement in their reading comprehension. This study did not produce significant gains, however improvement no matter how small is still progress. More research needs to be done with a focus on students who are not reading at grade level. Learning how to use new technology could have been one of the reasons why there were not significant gains. 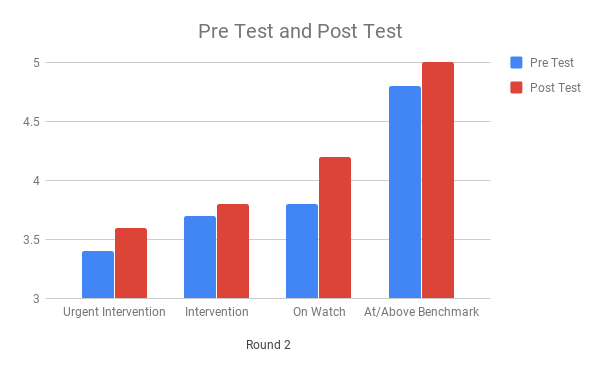 The next round of research needs to include more time for students to use the technology tools prior to giving the post test. The pre and post test also needs to be 10 questions long. With only 5 questions, it was hard to show significant growth. I would definitely recommend that you try your own round of research using different technology tools. Together we can change the future for these struggling readers.